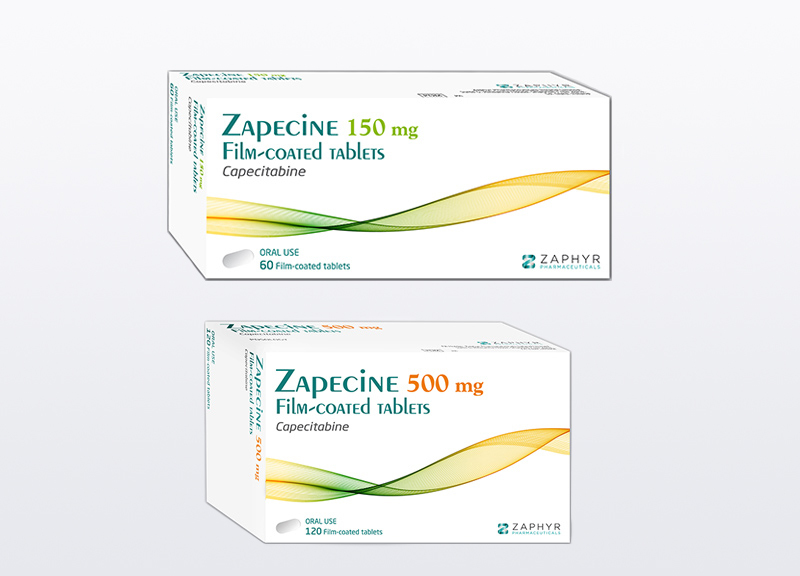 Name: Zapecine (capecitabine) film-coated tablets. Description: Zapecine (capecitabine) is a fluoropyrimidine carbamate belonging to the class of antineoplastic agents called antimetabolites. As a prodrug, capecitabine is selectively activated by tumor cells to its cytotoxic moiety, 5-fluorouracil (5-FU); subsequently, 5-FU is metabolized to two active metabolites, 5-fluoro-2-deoxyuridine monophosphate (FdUMP) and 5-fluorouridine triphosphate (FUTP) by both tumor cells and normal cells. FdUMP inhibits DNA synthesis and cell division by reducing normal thymidine production, while FUTP inhibits RNA and protein synthesis by competing with uridine triphosphate for incorporation into the RNA strand. Colon (large bowel) cancer. Capecitabine is used with or without other cancer medicines in patients who have had surgery for ‘stage III’ or ‘Dukes’ stage C’ colon cancer. First-line treatment of advanced gastric cancer in combination with a platinum-based regimen. Important: The drug information on this page is not a substitute for medical advice. The information may not cover all possible uses, actions, interactions, or side effects of this drug, or precautions to be taken while using it. Please see your health care professional for more information about your specific medical condition and the use of this drug.